Brazil - Will Bannon Become Bolsonaro's Kingmaker? 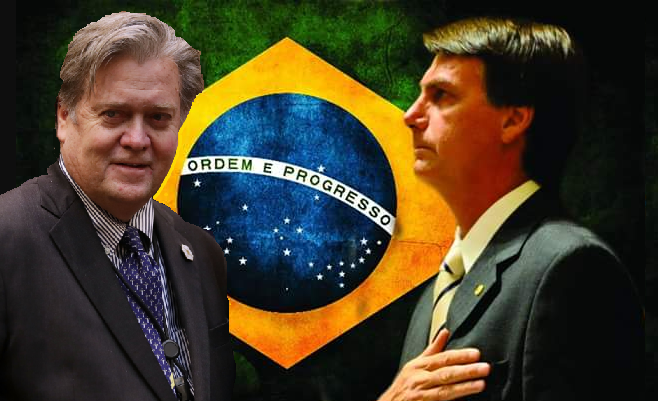 Conservative rightwing candidate Jair Bolsonaro is rumored to have hired the services of Mr. Steve Bannon, former White House strategist credited with leading Mr. Donald Trump to the US presidency. In Brazil, however, Mr. Bannon not only faces a Worker’s Party well engrained with nearly all media, but also a judiciary keen on releasing former President Lula (currently imprisoned for 12 years) and spearheaded by many former leftwing judges. On top of this, as we reported yesterday, social media (Facebook, Youtube, and Twitter) seems to have selected their winner already as reports came in during the summer that several rightwing conservative Facebook pages had been shut down. Several screenshots showing that any videos of Bolsonaro speeching are violating terms of service for Facebook are widely available. Related coverage: <a href="http://thegoldwater.com/news/35180-Brazil-Facebook-Continues-To-Censor-Bolsonaro-Supporters"> Brazil – Facebook Continues To Censor Bolsonaro Supporters</a>. Recent polling has shown that former President Luiz Inácio “Lula” da Silva leads Bolsonaro in the presidential race, but Mr da Silva himself currently remains in jail on a corruption conviction and it seems likely that he will not be permitted to be on the ballot. The UN Human Rights Committee, eager to prevent a runoff between two extremes in the two-round presidential election, stated earlier this month that Mr da Silva should be able to run, but Brazil’s foreign ministry responded that the Council’s recommendation had no legal significance. If the electoral court keeps Lula off the ballot, it will give Bolsonaro a good shot at being the top vote-getter in the October 7 election. It however remains to be seen who he will face then. Related coverage: <a href="http://thegoldwater.com/news/35011-Brazil-South-American-Solution-Needed-As-Venezuelan-Migrant-Crisis-Reaches-Crisis-Point-Video"> Brazil – South American Solution Needed As Venezuelan Migrant Crisis Reaches ‘Crisis Point’ (Video)</a>.